Let's talk French food, shall we? Have I mentioned that I will most likely be moving to Paris next September for about 9 months to write my dissertation? It's true. That's the game plan as of right now. So I've been investigating French food with a little more focus lately in preparation. To that end, I've been dipping in and out of Waverly Root's The Food of France while riding on the subway and in moments before going to bed. Root was a reporter for the Paris edition of the Chicago Tribune in the 1930's and the Paris correspondent for the Washington Post during the 1960's. The Food of France is a somewhat academic tour of perhaps the world's most famous culinary country, in which, chapter by chapter, Root lays out the history of a given region, its specialties and any other bits and pieces he can dig up. The books reads like an encyclopedic investigation of regional cuisine, as for instance, Root's meditations on the Scandinavian heritage of Normandy and the importance of apples and calvados, or apple brandy, in their cooking. So when I finally head to France, I'm pretty sure this is the one book on food I'll bring with me, looking up each region as I go. 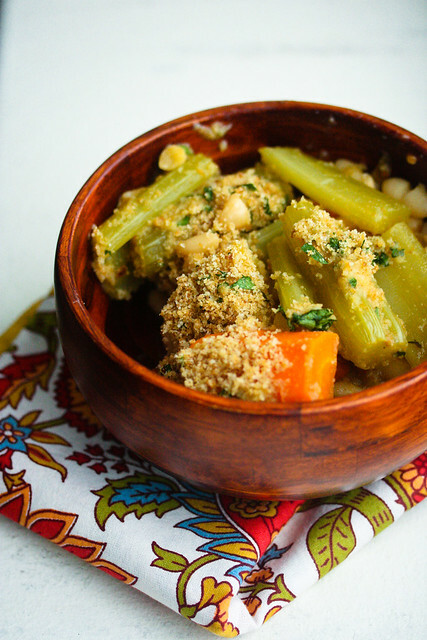 In the introduction to this recipe from his book The Café Boulud Cookbook, Daniel Boulud admits that he would never serve this vegetarian version of a cassoulet anywhere near Toulouse. I think Root would agree with this decision, as Root describes cassoulet as a concoction made by combining, along with beans, fresh pork, ham, a bit of pork shoulder, sausage and fresh pork cracklings. But it doesn't stop there. In Toulouse, and this is what separates their cassoulet from those of their neighbors, they also add mutton, bacon, Toulouse sausage and preserved goose or duck, or maybe even both. Certainly they would consider Boulud's version of beans and root vegetables a true abomination. But for the home cook who doesn't have eight or nine different types of meats laying around, and who might not want to invest in such an undertaking anyway, a root vegetable dish simmered with beans and topped with herbed breadcrumbs is a bit more manageable. And honestly, at least for now, I'd rather leave the true cassoulet in the hands of the Toulousain professionals anyway. And as always, the requisite note on ingredients and techniques. This recipe is a bit fussier than something as humble as a glorified bean and root veg stew might suggest. The reason is because Boulud wants you to drain the simmered stock from the beans/veg and then add it back in in increments, which in the end was not exactly worth the trouble. The idea is also to stir in a mixture of already-cooked tomato and onion into the bean layer, but keep the veg layer on top. This was probably worth it. And he calls for fresh bread crumbs, but they get soggy so darn fast. I really, really like panko because it tends to stay crispier. And since this recipe is already so far from authentic, that's what I'd use. Boulud asks that the pot be covered with a circle of parchment paper while the vegetables boil. This is a technique I've also seen used in Japanese cooking when boiling vegetables, and I imagine it keeps the heat in while still letting steam escape so that the vegetables, which aren't completely submerged, will steam, while the liquid reduces. Also, this makes A. Ton. So either feed a crowd or be ready for leftovers. 2 cups dried cannellini beans, picked over and soaked in cold water overnight, then drained. 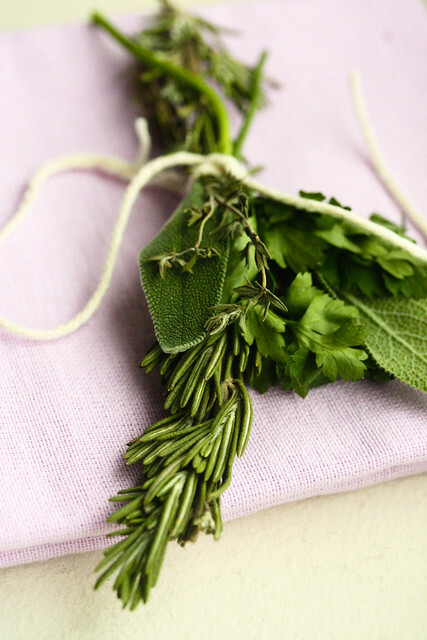 Bouquet garni - 3 parsley sprigs, 2 sage sprigs, 2 thyme sprigs, and 1 large rosemary sprig (because I happened to have some) tied together with kitchen twine. Before you start, cut a circle out of parchment paper that will fit inside your Dutch oven. Easiest to do this before you begin cooking so you can trace a line with the Dutch oven is still cold. Set the sheet aside. Put the soaked and rinsed beans into a Dutch oven and pour the stock over them. Bring the liquid to a boil and add the celery, carrots, turnips, fennel and the halved tomato, as well as the bouquet garni. Press the parchment paper circle gently on the top of the ingredients. Lower the heat a bit so the liquid simmers, and let cook for about 1 hour. You might need to stir a bit, and the mixture is done when the beans are tender. At about :50 minutes, season with the salt and pepper. As the beans cook, get to work on the tomato/onion mixture. Warm some oil in a medium sauté pan over medium heat and cook the onion and garlic. 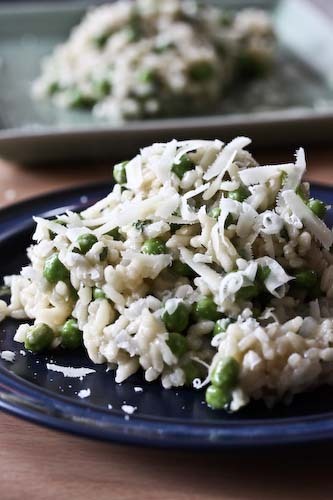 Season with salt and pepper, and cook, stirring, until they are tender but not quite colored. 5-10 minutes. Add the tomato paste and stir until the onions are well coated, then add the diced tomato and immediately remove the pan from the heat. Set aside. When the beans are done, remove the pot from the heat and remove and discard the boquet garni. If your stew is very soupy at this point, you can drain the liquid as Boulud suggests, adding it back in later, but if the broth is pretty well reduced, it's a step I think you can skip. Boulud suggests draining the stock, as I said, then transferring the vegetables to a separate dish. Stir the tomato mixture into the beans and, if you've drained the broth, add enough of it back in to just cover the beans. Layer the vegetables on top of the beans and moisten with a bit more of the broth. I had, by this point, used up all the broth. Throw together the crust by tossing the panko with the 2 pressed garlic cloves, the parsley and the melted butter. Distribute over the top of the vegetable layer. 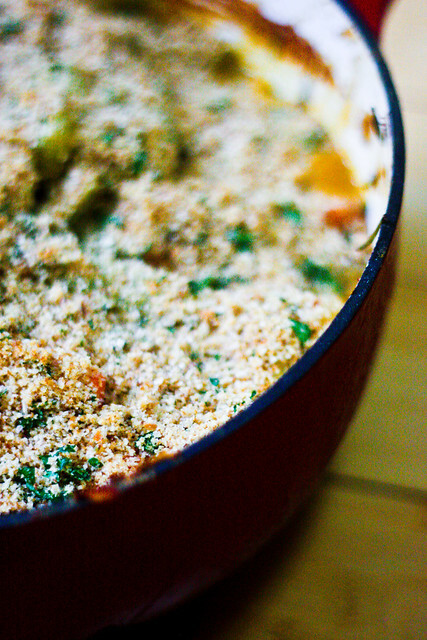 Bake the cassoulet for 15 minutes until the panko is golden and crusty. Serve with good bread. This looks like a perfect way to enjoy vegetables. Looks so inviting and comforting as well. How wonderful! This is my kind of recipes with the veggies and beans. 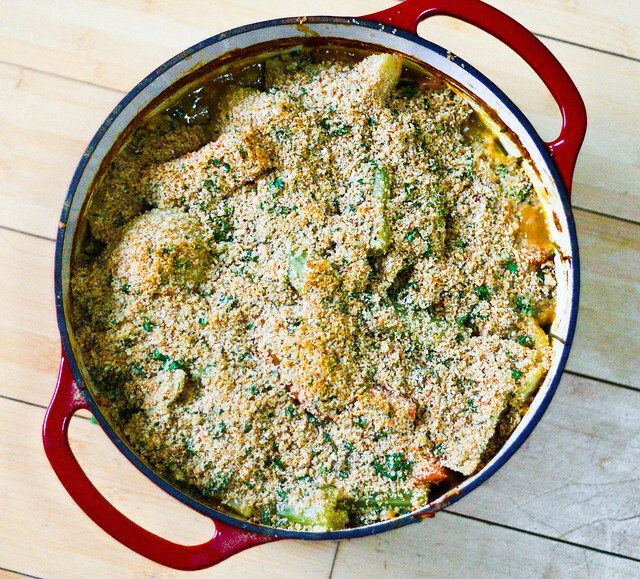 As heretical as it might be, vegetarian cassoulet can be totally delicious. I've made one from Mollie Katzen a few times - hers uses mustard greens, which are fantastic with the white beans. 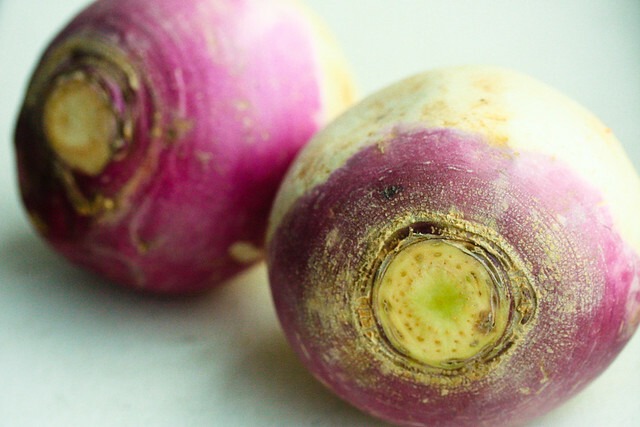 The root vegetable version seems absolutely perfect for winter. Looks delicious Andrea. I love how I get your posts sent to my email, now I never miss anything! Wish i can have this right on my table for dinner! super delicious! Thanks for sharing the recipe.